—Sergeant Stephen M. Powers corrects a recruit for not following directions during pick up at Marine Corps Recruit Depot San Diego, June 24, 2016. (USMC photo by Lance Corporal Angelica I. Annastas). Information from the Official MCRD San Diego Website. MCRD San Diego is also home to the Marine Corps' Recruiters School. Approximately 200 students attend and graduate from the school every other month, averaging 1,200 students a year. More than 50,000 retired military members entitled to use MCRD San Diego facilities reside within a 50-mile radius of the depot. The transformation of raw recruits into basic Marines begins immediately upon their arrival at the receiving barracks when each recruit first stands on the famous yellow footprints. For the next three days, recruits undergo in-processing to prepare them for their first day of actual training. They get haircuts, their initial clothing issue, and medical and dental examinations. They also take an initial strength test to ensure they are ready for training. All personal items not issued are stored until graduation day. During the next 12 weeks, recruits train hard to acquire the knowledge, discipline, team work abilities, and fitness level required of Marines. The physical training program is progressive and designed to build strength, flexibility, and endurance. It includes a graduated running schedule, calisthenics, obstacle courses, circuit courses, and confidence courses. This program helps give recruits faith in their own abilities. Other physical training events challenge recruits to overcome potential fears. These events include rappelling, pugil stick and bayonet skills training, combat water survival training, and training in the Marine Corps Martial Arts Program (MCMAP). Classroom instruction includes general military subjects, such as Marine Corps history, customs and courtesies, first aid, and how to use and care for the M-16 A4 service rifle. The Marine Corps instills its core values—honor, courage, and commitment—through practical application and discussion. A key component of recruit training is the Marine Corps Martial Arts Program. 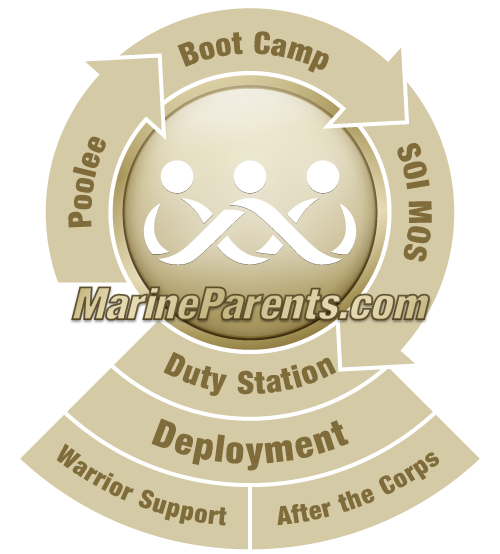 With its strong emphasis on mental discipline and character development, the MCMAP is distinctively different from other close-combat systems. The skills acquired and lessons learned in the MCMAP will better prepare Marines for challenges they may face during operations, from humanitarian missions to armed combat. After four weeks of training aboard the depot, recruits move to Weapons and Field Training Battalion at Edson Range, Marine Corps Base Camp Pendleton, California, for three weeks. At Edson Range, recruits undergo marksmanship training, martial arts sustainment training, and field training, introducing them to a variety of basic infantry skills. Table I known-distance firing range with targets at 200, 300, and 500 yards. Instruction in basic individual combat skills, such as field living and the fundamentals of tactical movement. Table II marksmanship course which includes firing while wearing combat gear. Recruits begin preparing for graduation. Final tests are conducted in MCMAP, drill, and physical fitness. There is a comprehensive written exam as well. The recruits return to Weapons and Field Training Battalion for the Crucible, a 54-hour event testing all their training, during week 11. During the Crucible, recruits encounter a series of 32 challenges, distributed over a course covering more than 40 miles. Sleep is restricted to just four hours a night, with only three meals during the three-day period. Each obstacle encountered presents strenuous mental and physical challenges, requiring the recruits to work together as a team—no one completes the Crucible as an individual. At the conclusion of the Crucible, recruits complete a nine-mile hike taking them to the top of a hill known—and with good reason—as "the Grim Reaper." The recruits then return to the Weapons and Field Training Battalion parade deck for the moment they've been working toward for 12 weeks—earning the title of "Marine." The recruits are presented with the Eagle, Globe, and Anchor pin during the Emblem Ceremony, marking the completion of their transition from civilians to Marines. After the ceremony, the new Marines head to the mess hall for a "warrior's breakfast" of steak and eggs. The new Marines return to MCRD San Diego for their last week of training which includes a battalion commander's inspection and graduation practice at the beginning of the week. Family Day is held on Thursday of that final week, and the new Marines participate in a five-mile "Motivation Run" as their loved ones watch. After Liberty Formation, the Marines are able to reunite with their families and friends and spend the afternoon aboard the depot together. After 13 challenging weeks, graduation day arrives. After graduation, the new Marines are allowed to go home for ten days of leave. Approximately 90,000 family members and friends sit in the graduation stands each year to celebrate their loved ones' momentous achievements. They will see a noticeable change in their new Marine—in those 13 weeks he will have transformed from a civilian to a young man who is mentally and physically stronger, more confident, and disciplined. After graduation, new Marines have up to 10 days of leave. They must then return to Camp Pendleton for additional weapons and field training. Each new Marine then attends one of 36 different Military Occupational Specialty (MOS) schools for training in a specific job field. Whether the MOS is infantry, field artillery, computer programming, avionics, or air traffic control, each Marine will face a rewarding and challenging road ahead in a career that will take them to assignments on the East or West Coast, Hawaii, and/or Okinawa. MCRD San Diego Recruiters School is an integral part of the Corps' continued success in recruiting and retention. The first Recruiters School was established at MCRD Parris Island, South Carolina, in 1947. The San Diego school was activated at MCRD San Diego in October, 1971. Schools operated on both coasts until August 1972, when MCRD San Diego became the sole site for the Recruiters School. More than 1,500 students graduate from the school every year.